Ever want to monitor your home PC from work? Want to monitor PC’s across your corporate network from your web-browser? Do you want the ability to remote control, administrate, and monitor remote computers? SpyAnywhere is your solution! SpyAnywhere provides the power to remotely control computer’s with SpyAnywhere installed – all from your favorite web-browser! SpyAnywhere allows many powerful controls for remote control, and also allows you to remotely monitor other computers. SpyAgent allows you to accurately log ALL activity on your PC: websites visited, applications ran, internet connections made, windows viewed, passwords used, keystrokes typed, and even screenshots! SpyAnywhere integrates with SpyAgent to create a superb local and remote monitoring solution! Platforms: PC Desktop (Windows: XP SP2, Vista, 7, 8, 10). Languages available: English, German. Platforms: PC Desktop (Windows: XP SP2, Vista, 7, 8, 10). Languages available: English. AlphaUserPoints (AUP) powered by social rewards technology is a user reward, crowd funding donor and fan acquisition application and webservice for Joomla 3+. Designed for crowd funders, webmasters, developers, online marketers and experts AUP is used to reward Internet users for publishing content, building their fan network and rewarding their supporters for sharing messages. HOW TO USE APPLICATION: Use AlphaUserPoints 2.0.4 PRO with Social Rewards to assign points to registered users according to specific user behaviour and, or website activities. 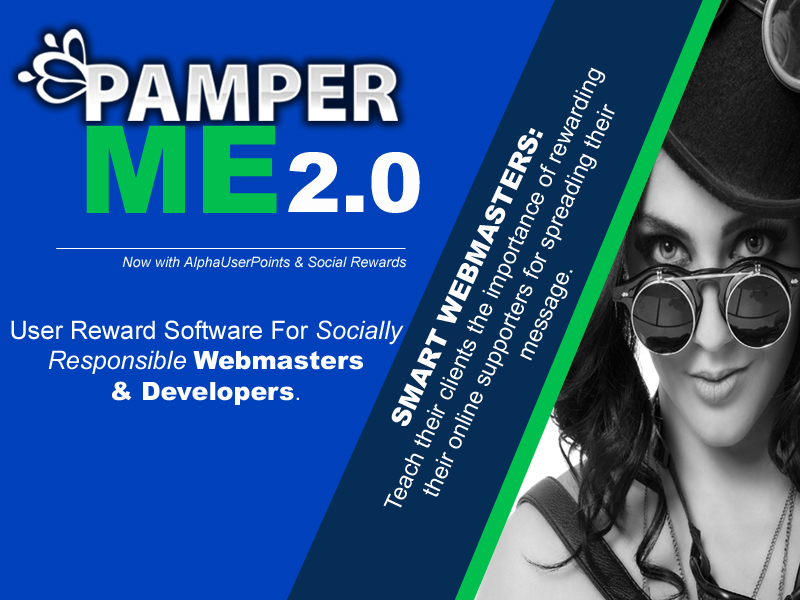 AlphaUserPoints 2.0.4 PRO with Social Rewards is designed for customers that want to: * Reward users for using their website with points; * Leverage the Pamper Me Network’s web services to build their fan network, share content and reward internet users for doing so. Although AlphaUserPoints (Free & Webservice) can be used for any website, it is fantastic for crowd funding, incentives, online contests, challenges, social networking, games, e-commerce and related functions. AUP PRO boasts a complete system of ranks and medals and powerful premium add-on features allow you to reward individuals for sharing articles, news releases, special offer promotions, videos, photos, events and groups, track multi-level social media referrals as well as reward users for their online support using points, cash, prizes and related benefits. AlphaUserPoints is available as a Free legacy component; Free & premium legacy core plugins; social rewards powered add-on plugins; premium web service powered by social rewards technology and as a hosted social rewards / self-replicating contest solution powered by social rewards technology. WHY UPGRADE TO AUP SOCIAL REWARDS: AlphaUserPoints powered by SocialRewards is an essential tool for online marketers and, or experts that wish to: – Recruit fans, crowd funding donors, affiliates and social influencers; – Reward social media users (fans) for their online support; – Reward crowd funding backers for their online support; – Deploy self-replicating online contests; – Build self-replicating fan networks; – Reward website visitors for sharing content with their friends and family; – Building self-replicating, viral fan lists; – And much more. Use the AUP Core Legacy components FREE of charge to manage your loyalty management program and then upgrade to PamperMe 2.0 if you require more control over your data, and opt-in mailing lists. PamperMe 2.0 Social Reward Bundle is a complete list of premium online marketing tools designed specifically for webmasters, online marketers, software developers and experts that wish to reward socially responsible Internet users for sharing content, building their fan networks, launching crowd funding campaigns as well as online contests. This package includes AlphaUserPoints 2.0.4, K2 plugin for AUP, Multi-tier Plugin for AUP, AUP & Social Rewards installation and configuration documentation, AUP Developer API documentation and the Better Way To Crowd Fund Success Kit ebook. This bundle is for customers that have installed the Free AlphaUserPoints component and, or webservice and wish to run their own social rewards powered website, online contest, crowd funding campaign and, or related promotion. Free iPhone Data Recovery recover data lost due to iOS upgrade, deletion by mistake, device lost or broken or other reason. Support all the latest iPhone, iPad and iPod Touch. It help you get your lost data back, include contacts, messages, photos, videos, WhatsApp or other important data. With intuitive interface, it’s easy to use and no prior recovery skills needed. May 26, 2016 Image Editing, Multimedia & Design, SoftwareiFotosoft Ltd.
Just looking for some photo collage templates or mosaic photos? Need to make gorgeous montage photos as profession. iFotosoft Photo Montage is a special photomontage maker to create stunning mosaic photo with many tile-images. The advanced tiling techniques and special effects empower you to create photo collage in shape with ease. And you can also perfect the montage photo with micro-image pattern, repetition, grid and border options and other splendid features. As a versatile photomontage maker, the program can make stunning photo mosaic with thousands of images in high resolution, design photo collages in shape according to any provided templates, support photo mosaic, tile mosaic, shape mosaic and other photo mosaic types. Before you make montage photos, you can add special effects to create montage photos. There are provided funny frame to make your photo mosaic special. And then you can adjust the columns of the tiles or pixels of the tiles to make photo mosaic in a certain size. When you want to create photo collage in shape, you can use match color to remove the color of the background image. How about the output of the photo mosaics? The program can combine more than 2,000 mosaic tiles in a breathtaking result, up to 16,000 pixels wide with unlimited pixels height for montage photos, the mosaic photo or photo collage can be used for mural, banner, desktop or even wallpaper. What?s more, the program applies minimal colorization to closely match the original image and proper placement of tile images to present the optimal result. Just share the montage photos to Facebook, Twitter, Flickr or other social media site. And you can also send the files via Email, Messages or AirDrop, there are multiple sharing methods for you to enjoy the gorgeous montage photos with others. Key Features: ? Make stunning photomosaic with thousand of images in high resolution. ? Design shape photo collages with any provides photo collage template. ? Support photo mosaic, tile mosaic, shape mosaic and other photo mosaic types. ? Create different types of montage photos with few clicks. ? Apply different effects to the original image to create desired montage photos. ? Customize columns and pixels of tiles to adjust the size of the output file. ? Choose funny frames to make your photomosaic special. ? Match color to design photo collage without considering the color of background image. ? Combine more than 2,000 mosaic tiles with a breathtaking result. ? Up to 16,000 pixels wide with unlimited pixels height for montage photos. ? Minimal colorization to closely match the original images. ? Output photo mosaic or photo collage for mural, banner, desktop or even wallpaper. ? Proper placement of tile images to present the best result. ? Save mosaic photos or photo collage to PNG, JPEG and TIFF formats. ? Share photo to Facebook, Twitter and other social media websites. ? Connect mosaic photos to Email, Messages, Photos, Airdrop and other methods of system. ? 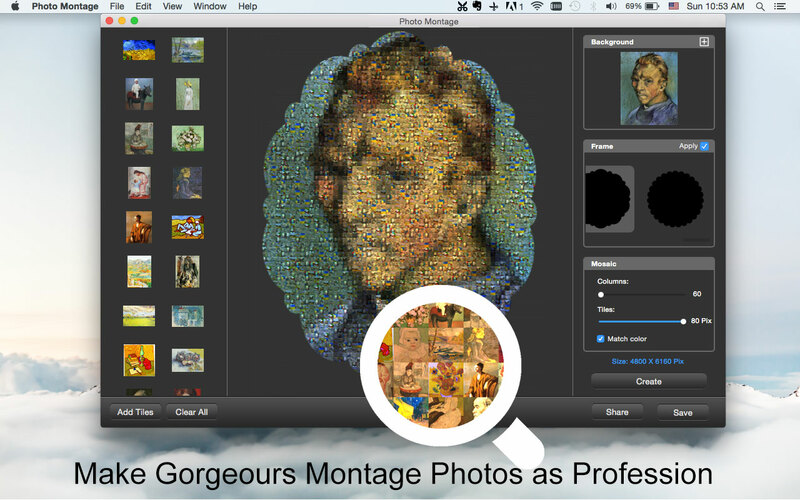 Support multiple photo formats even RAW files as the tile images for making montage photos.